We really loved a certain Cabo Rico 38 we had seen before we listed Independence. So, as soon as we sold Independence, we made a marketplace offer on her. Oh, how happy the sellers would be to finally sell a boat that had been listed for 9 months, especially since they already own their "new" boat! Welcome to buyer's despair. The sellers didn't want to negotiate the price. There's approximately 1 trillion boats listed for sale. We're pretty difficult though and had narrowed our search to just Cabo Rico 38's. We didn't like the ones with new engines because the sellers had done shoddy jobs and we'd wind up paying the "new" engine price and then putting in a new-new engine the right way. 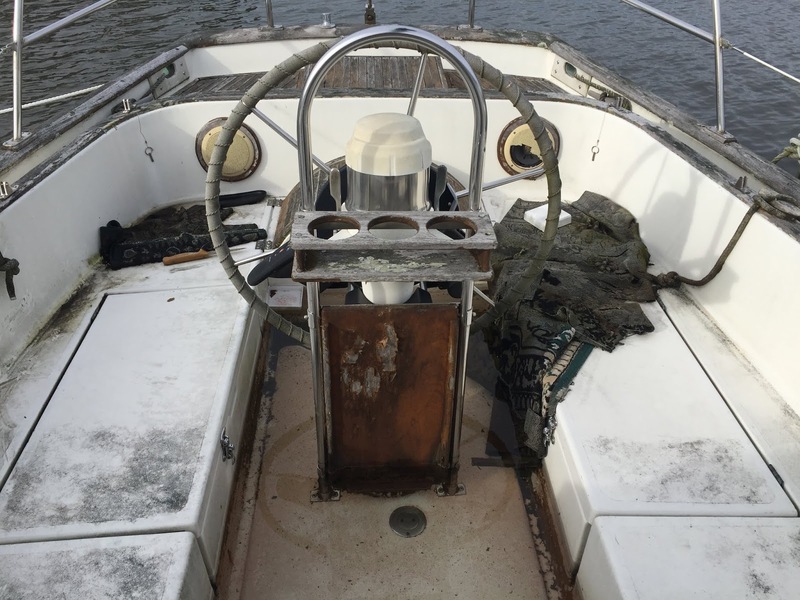 In fact, seller interference with perfectly good boats is a huge problem for us buyers. We found a reason to reject all the boats listed. 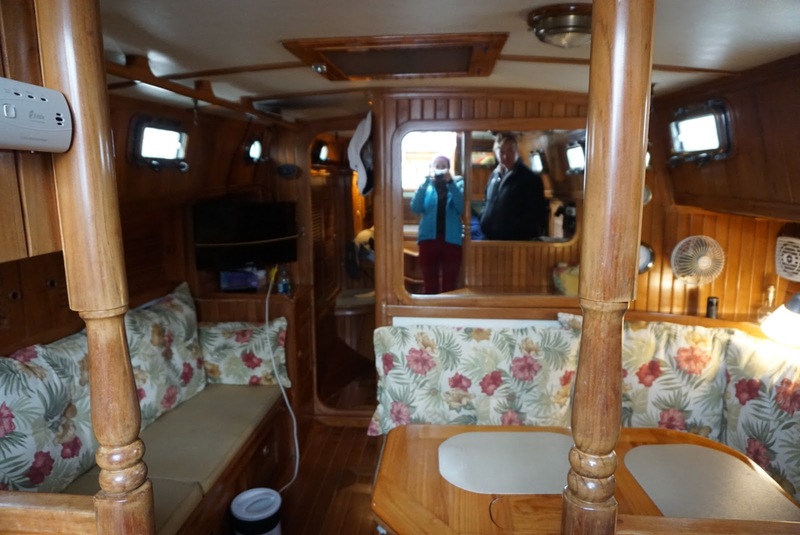 For instance, this boat featured "a new engine" and was ready "to take us around the world" for "just $89,000". It appeared to be in the process of sinking. Matt posted to a Facebook owner's group, asking if anyone wanted to sell us their boat. I was against this tactic as surely a boat that was for sale would be publicly for sale, Facebook only exists for evil, and everyone wants too much money for their 30 yr old boats anyway. Remarkably, an owner contacted us and listed a very reasonable asking price. 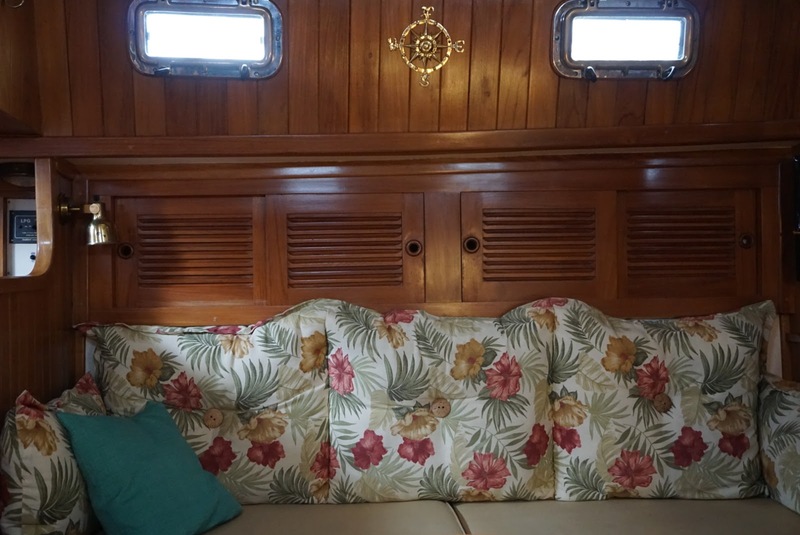 We drove to Virginia, saw the boat, and walked away with a handwritten listing. 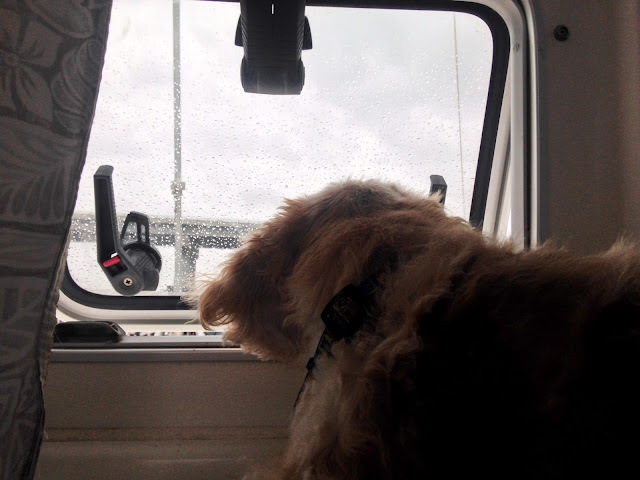 Hastings checking out the new boat. We consulted my very complicated spreadsheet and came up with a full price offer, which (thankfully!) was accepted. It was now Dec 19 and we scheduled the survey for after Christmas. Finding the surveyor was easy: we are lucky enough to have knowledgeable friends in the area. Thanks for the recommendation, Max! 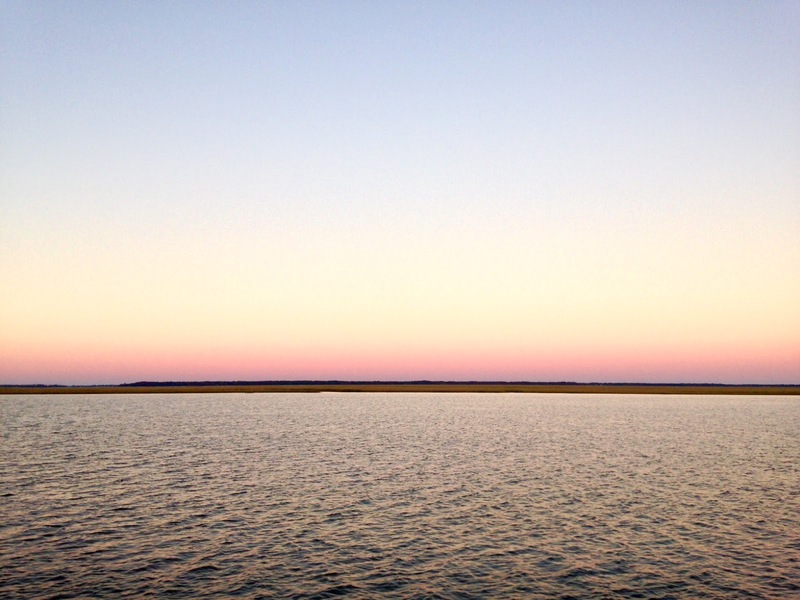 Survey day was remarkably pleasant. The weather was nice. The sea trial went well and we didn't break the boat or injure ourselves. 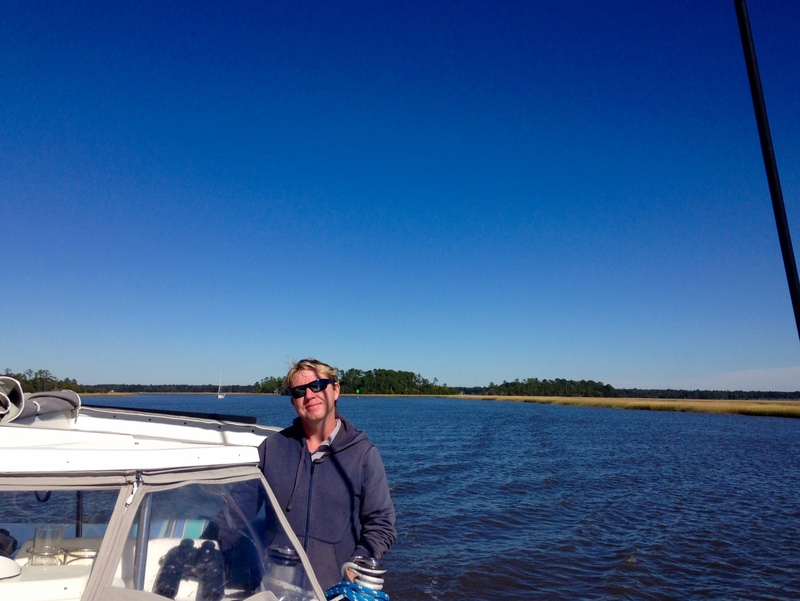 We verbally accepted the boat and agreed to meet in 1 week to close the deal. The surveyor listed 5 items to fix (fire extinguishers, smoke detectors, electrical upgrades). 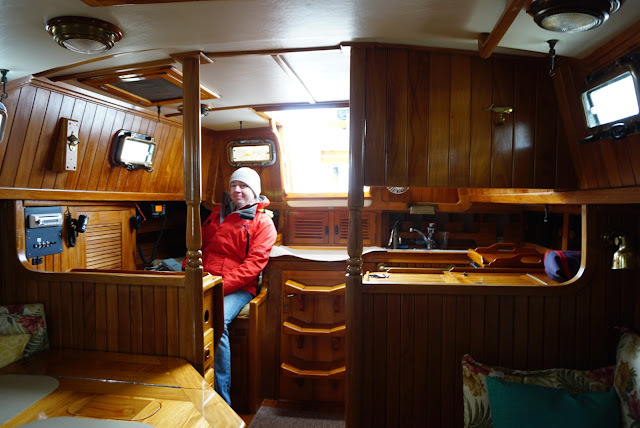 Matt sitting on the starboard side quarter berth / guest room / battery compartment / nav station. 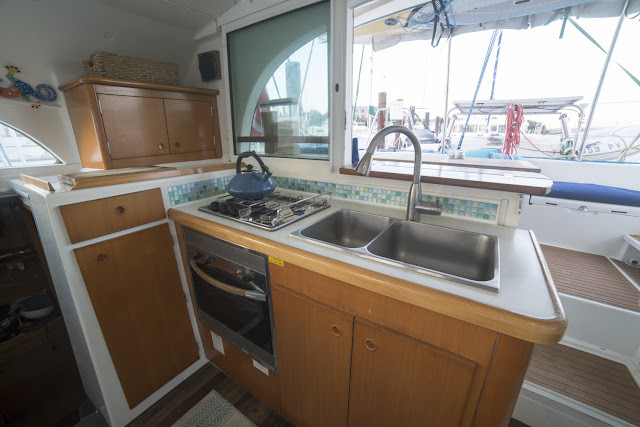 Galley is to port. I had already gotten the title search from the Coast Guard (even though they were shut down). Matt sent the survey to our insurance agent and organized our insurance. I prepared all the purchase documents from our hotel room. We met the sellers at our bank, had the bill of sale notarized, and wired the funds. We then emailed the Coast Guard the Bill of Sale. 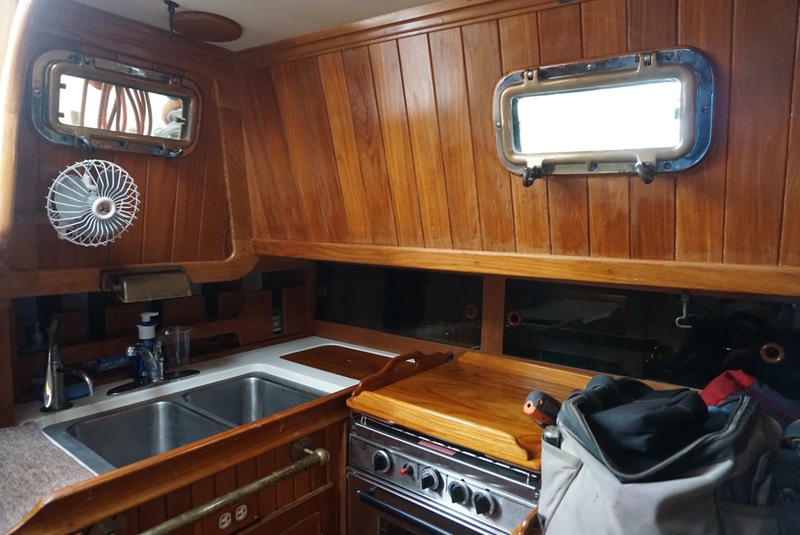 I was a little intimidated to close the boat ourselves without a broker, documentation agent, or escrow service, but I saved $$$ and it was very straightforward. Closing day was 3 weeks after we had first seen the boat (only about 7 business days). Such an easy deal, and the only paid outside help was our surveyor. It was meant to be! Have you ever had an easy transaction? Choosing the "next" boat seemed like an overwhelming task. There are about 30,000 sailboats listed on Yachtworld at the moment! We drew up a list of our “requirements”, and then we did about a year’s worth of Googleing. Thank goodness they don’t charge per Google. The term “bluewater boat” gets batted around quite a bit and I’m not sure anyone could agree on what makes a boat qualify. 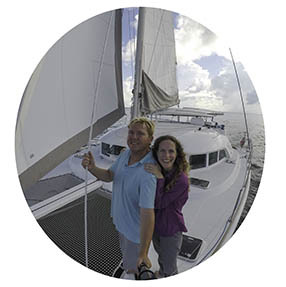 There once was a blog by a couple who sailed a Gemini catamaran around the world. 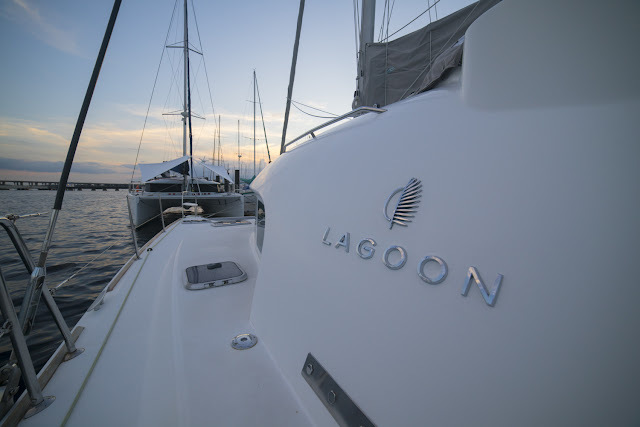 Many folks have sailed Lagoon 380s around the world. To us, these are not bluewater boats, and it’s not because my two examples are catamarans. It’s because they’re both crappy boats to take into “bluewater”. Here’s just a few items that come to mind when I think about a salty, bluewater sailor. If you're looking for more information on bluewater sailors, I highly recommend Sailing a Serious Ocean by John Kretschmer. In the book, Kretschmer lays out his recommendations for features to look for on an ocean cruising boat. It’s a great read. Shoal (ish) draft. We don’t want to change what we do too much, so we picked 5’ as being the maximum draft we were comfortable with. This is the one thing that limited our choices more than any other. Sexiness. We don’t want to drive a Catalina, a Hunter, or a Beneteau. Those are, of course, bad examples since none of them are bluewater boats (in our opinions!). 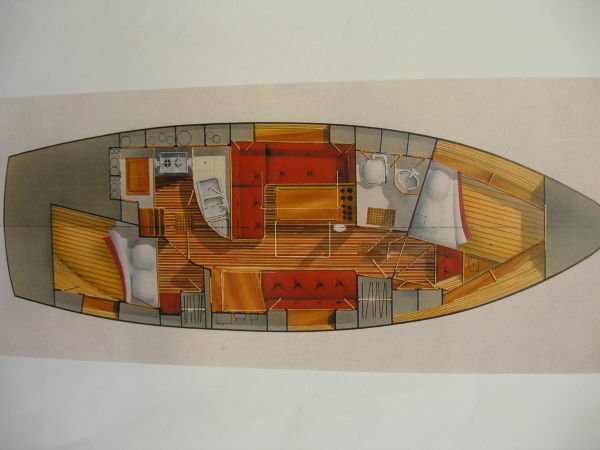 They are fine boats for certain purposes and we loved the Hunter we used for ASA classes. It's a case of different horses for different course and we are looking for our horse for our course. We want something beautiful that we can really be proud of. Budget and Size. 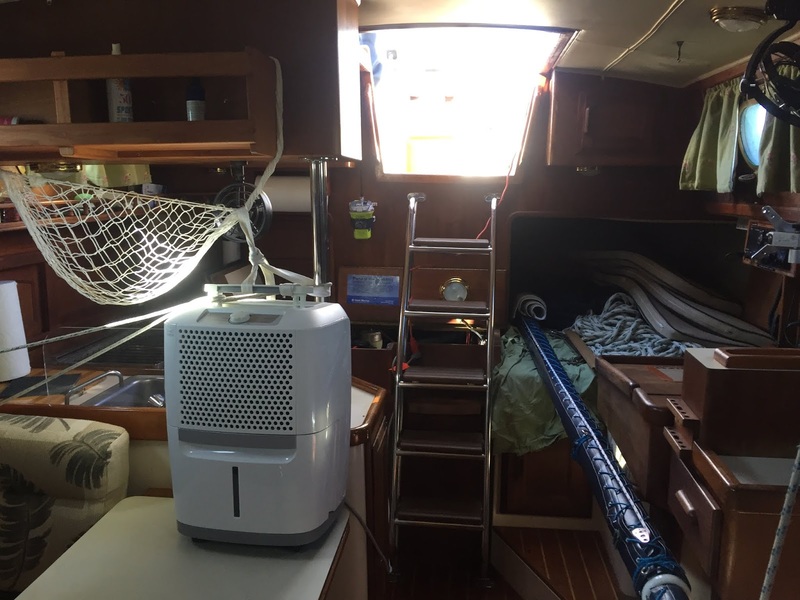 We wanted the whole package (including refit and upgrades) to cost under $100k. 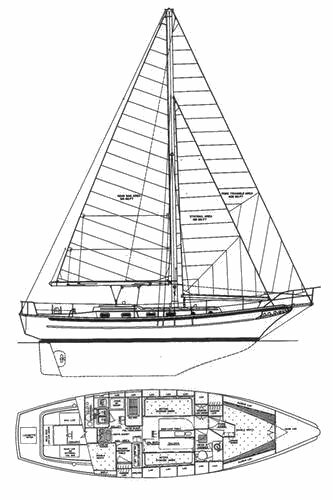 We also didn’t want a boat any longer than the catamaran, so we limited ourselves to the 34-38’ range. After an exhaustive search and talking to every “expert” we knew, our list was remarkably short and all Crealock designs. I would say we have a type, but it just happens that Perry’s designs that we liked all had deep drafts and shoal versions were very rare. Island Packets were removed from our list due to a design issue that we weren’t happy with. With embedded chainplates that are difficult to inspect properly, we didn’t feel comfortable crossing oceans in one. 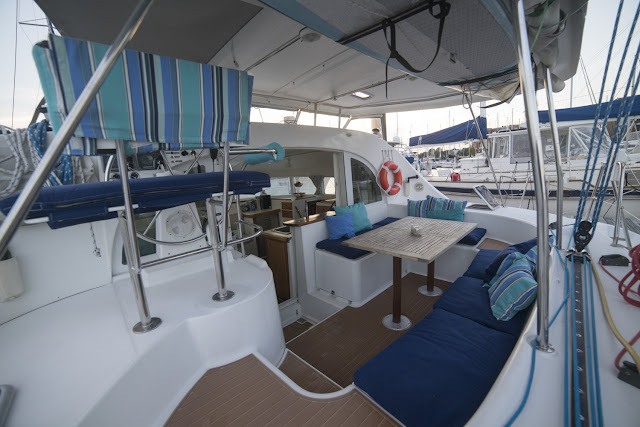 After getting aboard a Cabo Rico 34, it was removed from the list. 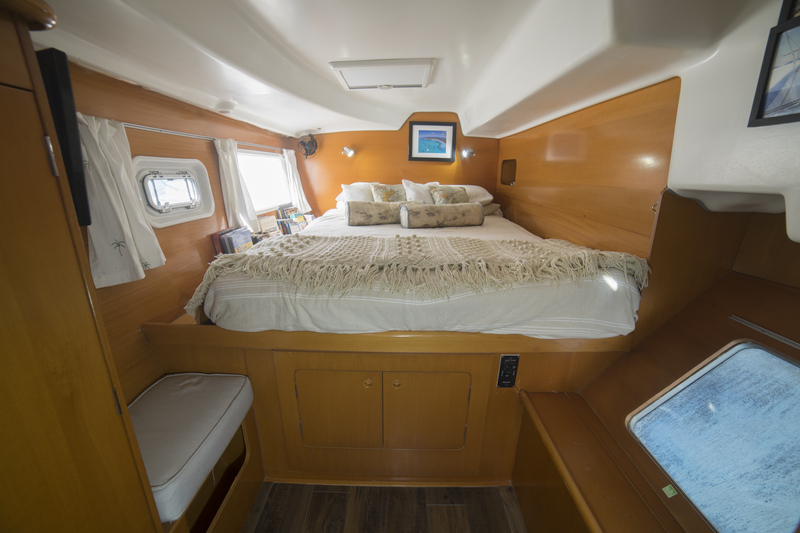 It looks great in photos, but is just a tad small to sail across oceans on with several people and stores to keep them comfortable. They are also quite rare (only about 30 were made) and they are quite expensive (more expensive than the Cabo Rico 38). The Cabo Rico 34 floorplan. It looks fine, but each area is a total hobbit hole! Aft cabin suited for Hastings only. The Pacific Seacraft 34 we found to be a bit small too, but it is a lovely boat that we both really like. We could have made either one work for us, but we knew we’d be more comfortable with just a few more feet of space. Pacific Seacraft 37s are remarkably expensive. We found a few of them that were shoal draft and whose owners were, for lack of a better term, desperate. But they still came out to be $20-30k more than the CR38. 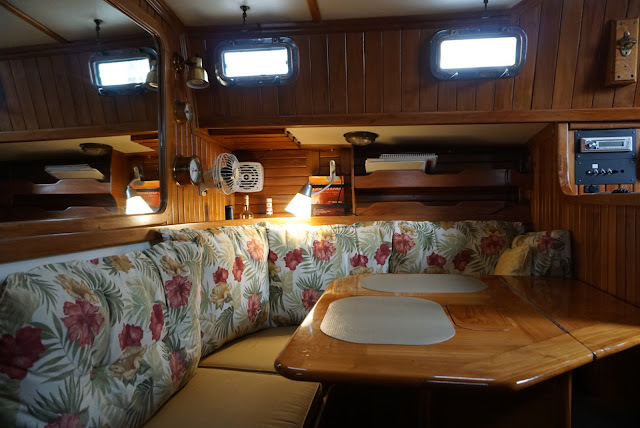 We liked the Cabo Rico 38's interior better. Once the choice was clear, it was just a matter of finding the one. When we decided to put our catamaran up for sale, we knew it would be a drawn out and painful process from start to finish, and it didn’t really disappoint. We thought long and hard about exactly how we wanted to do it, the timeframe we had, and what our goals were. Below are just some of the decisions we made and how we made them. Timeframe. One broker told us that the average time a boat is listed for sale on Yachtworld is 310 days. 310 days! This of course includes all boats of every type, and anyone who has looked for a used boat to buy can attest that almost everything listed for sale is terrible. 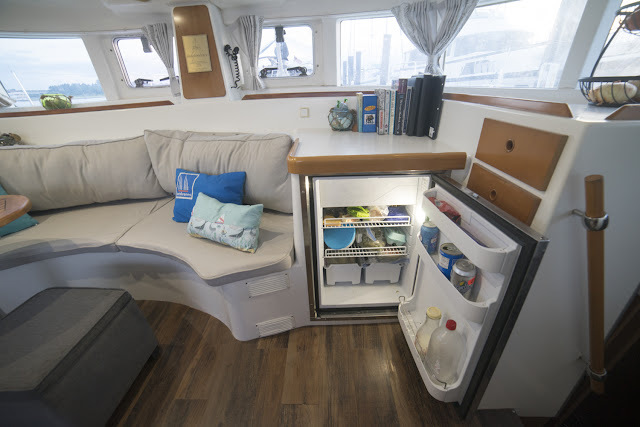 We knew that catamarans were more in demand and should move faster, but there are still many that languish on the market for far longer than they should. 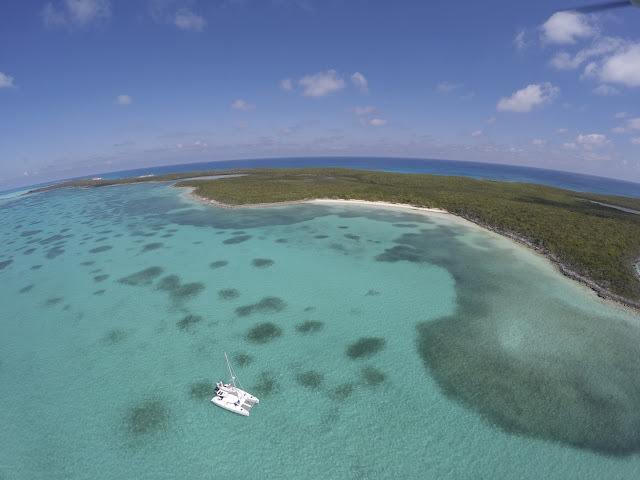 Our number one goal for our selling endeavour: to get back to the Bahamas on a new-to-us boat this season, thereby making the pain as minimal as possible! Placement. When we decided to sell, we were in North Carolina. 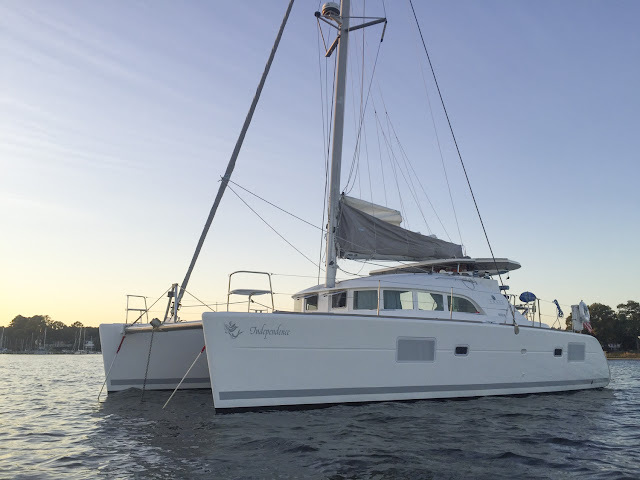 Having a catamaran for sale anywhere outside of Florida hurts your chances of a quick sale. Catamaran shoppers are going to go to Florida at one point or another. The chances they ever make it to North Carolina? Poor. Most buyers want to hop on board and set off for the islands, and they want to leave from Florida. The problem for us was insurance; our company required us to be outside of Florida until November 1. So we wasted a lot of time from August to November bumbling around the Carolinas getting hit by hurricanes. Oh, the irony. Staging. Look at most boats for sale on Yachtworld and they have one thing in common: Terrible photography. People’s junk clutters up the counters, photos are clearly from brochures, or they are clearly very old. 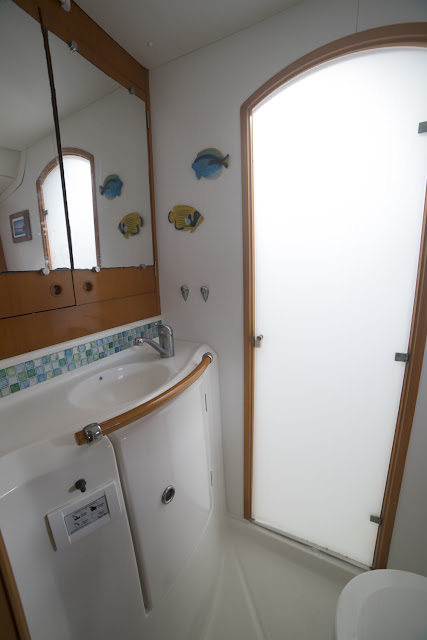 We’ve even seen one boat listed that had timestamped photos showing they were taken in 2006. Umm, it’s 2019? Absolutely gorgeous Pacific Seacraft 37, our #2 boat. It's hard to see how pretty it is with all this junk! It had been on the market for 15 months with 0 offers. No matter what you are selling, you must show it in the best possible light. That means great photos, but it also means staging it and setting it up so that absolutely anyone would immediately feel at home and see themselves living there comfortably. Put away the family photos, clean up your tools, and unclutter the counters. If you don’t have a good, wide-angle lens, make sure your broker does. And if he doesn’t, then consider hiring a photographer or even getting a better broker. Make sure it is clean and spotless, and even bake some cookies if you have to! Pricing. 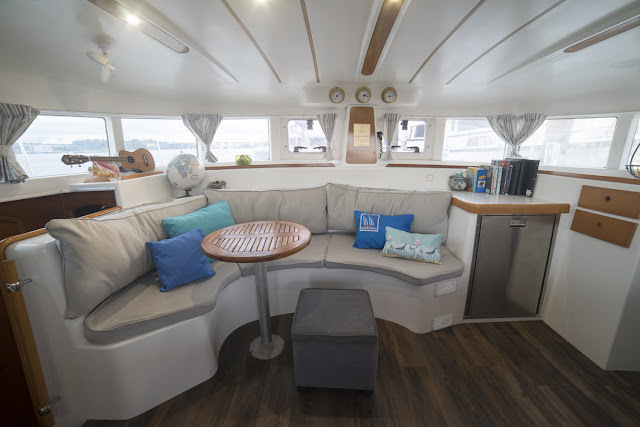 We did our own market analysis and came up with the price that our boat should sell for, and therefore what we should ask for it. We came up with this number analytically, and we used the same process that we used when we went shopping for our boat. 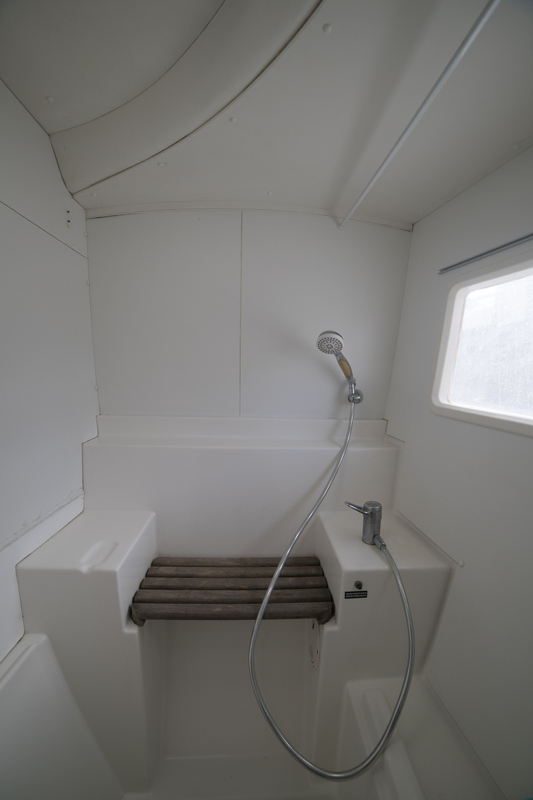 The boat's market value is what people are going to pay for it, and it’s based on the amount of demand in the market and the condition of the boat. The condition of the boat is very simply how it compares to a boat that has just come off the factory line. Most of the time “upgrades” make it less like factory new, and therefore add no value. The exceptions are big items like air conditioning and watermakers, but only if they were professionally installed and working like new. Of course, it’s complicated. 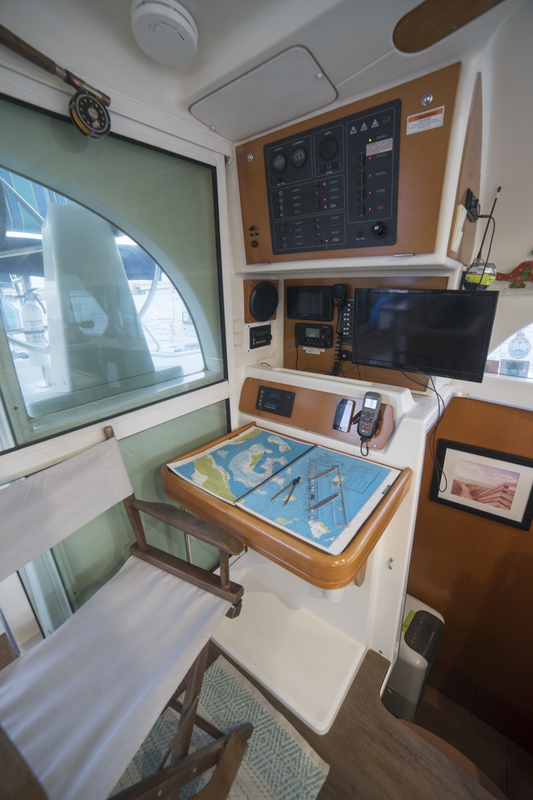 Since we are now looking from both the selling and buying perspective, we can certainly attest that boat pricing is a messy business. 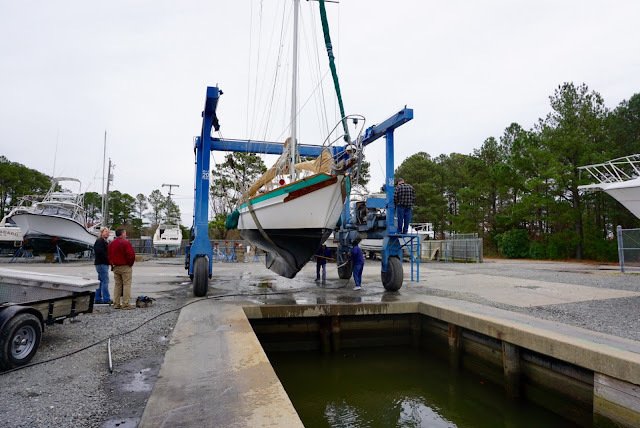 In our experience, you are going to get 80-90% of your asking price, depending upon the condition of the vessel. Whether or not we listed with a broker, or what options or upgrades we had made did not matter in the end. We knew most of this from previous dealing with boats. When I spoke to our broker he was very much not looking forward to telling us how much money we were going to get for the boat. The numbers he mentioned matched mine exactly, and he was surprised to hear me say, “Yeah, that’s what we figured." Representation. 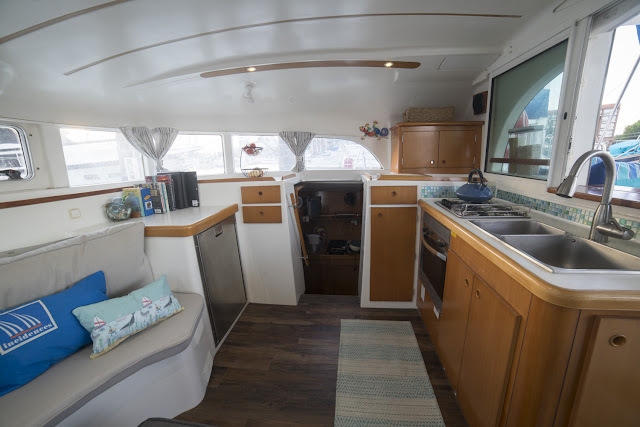 Friends of ours have had amazing success selling their boats on their own. 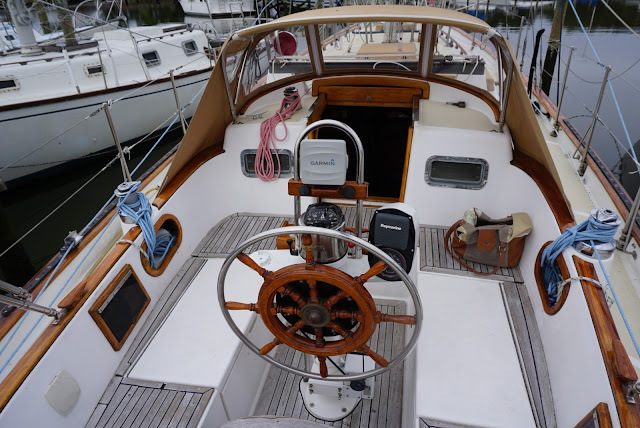 As a buyer I can tell you that anyone looking at Yachtworld is also looking at Sailboatlistings, so chances are you can easily market a boat yourself. 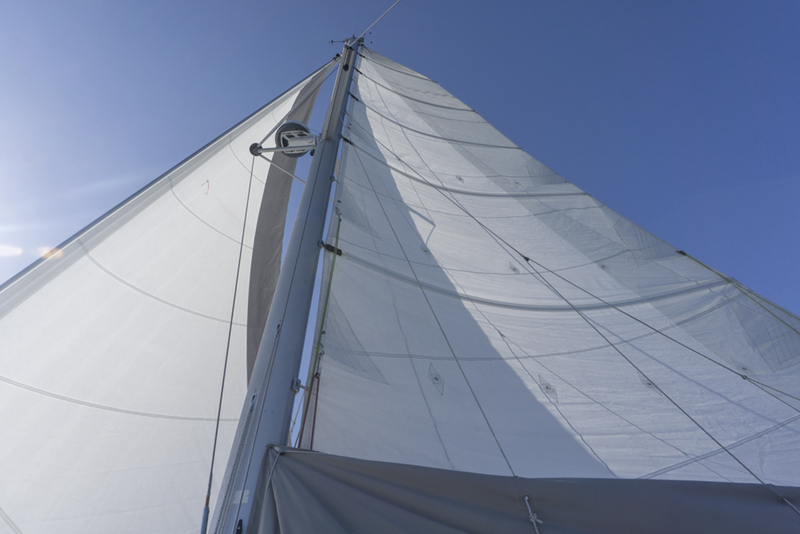 Sharing your listing on Facebook sailing and owners groups is also a winning strategy. We decided to go with a broker because neither one of us is a salesman. 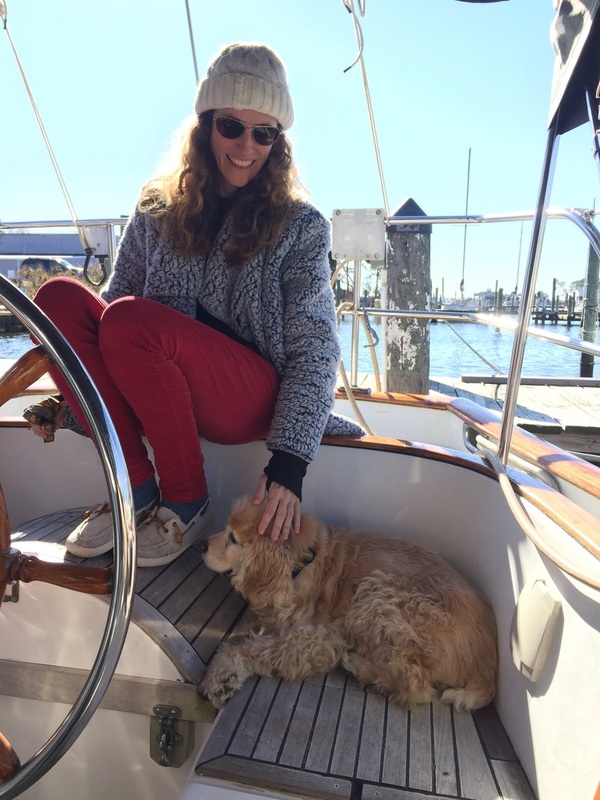 Our boat dog is also no help. 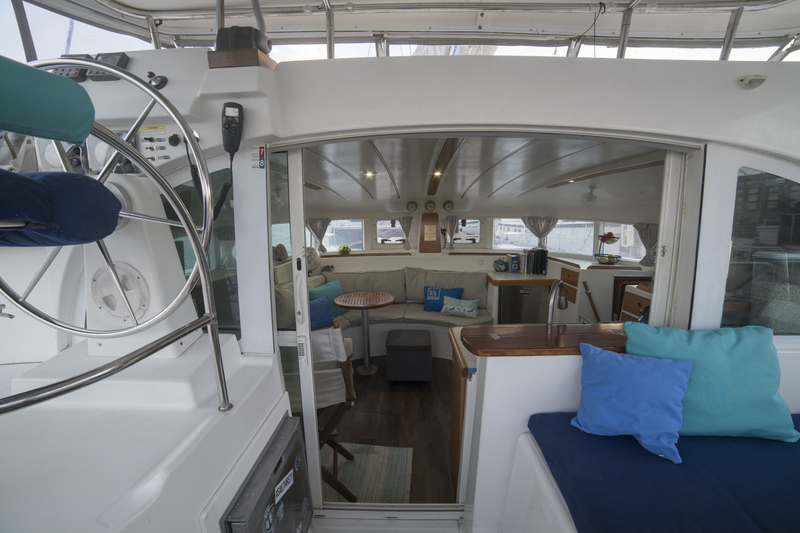 We knew that the buyer for our catamaran would most likely be a first time boat buyer, and they would most likely have a buyer's broker. In this situation, having a broker to handle the other broker and arrange the sea trial and survey for us seemed like the right choice. So was it the right choice? In the end it cost us 10% and a lot of aggravation, but it was the right choice for several reasons. We knew our broker and trusted him, which made the process much easier. We knew (because he sold the boat to us 4 years ago) that he would follow up on leads and reply to messages, which is way more than we can say about some brokers we have met in the industry. Picking a broker is a big problem. If we hadn’t had previous experience with our broker, I have no idea how we would’ve found one that we were happy with. 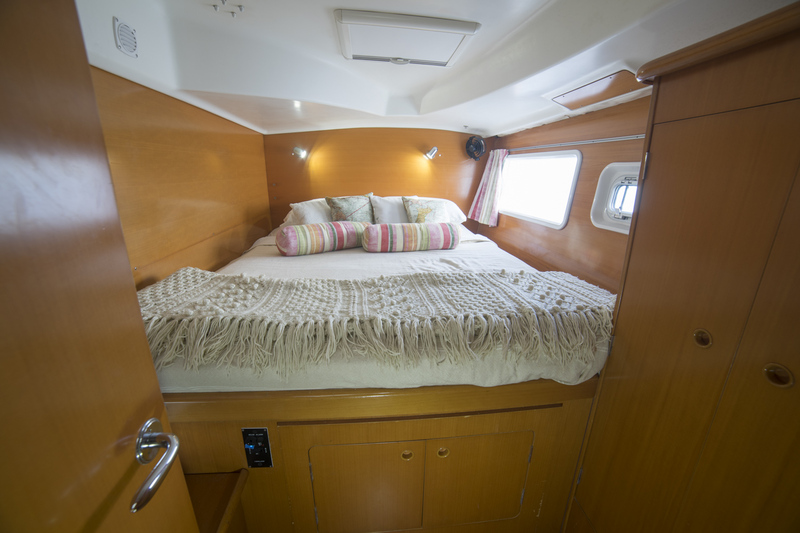 If we ever sell our monohull, chances are we will do it on our own. But it’s a different boat and a whole different ball game. So how did it all shake out? 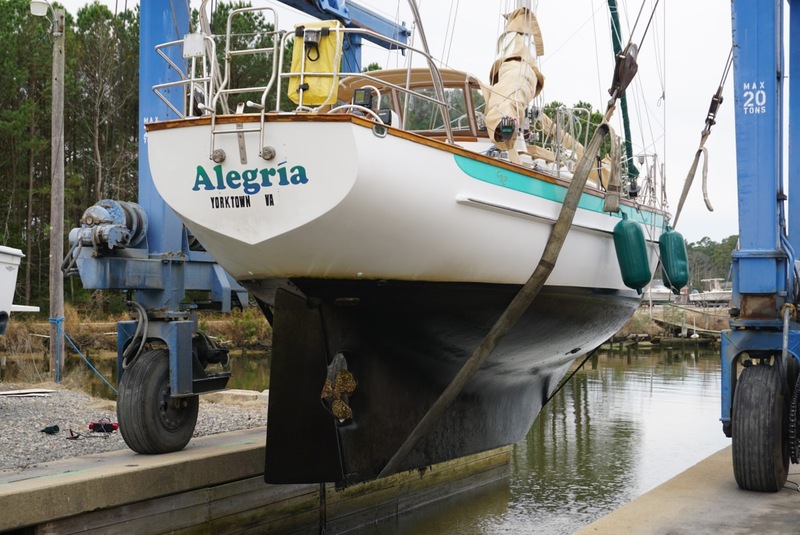 We sold our boat just over 60 days after it was listed on Yachtworld. We also sold the boat for the amount of money we felt it was worth, that is, the amount of money we would’ve gone out and paid for it. Have you ever sold a boat or a home? What was the process like for you? 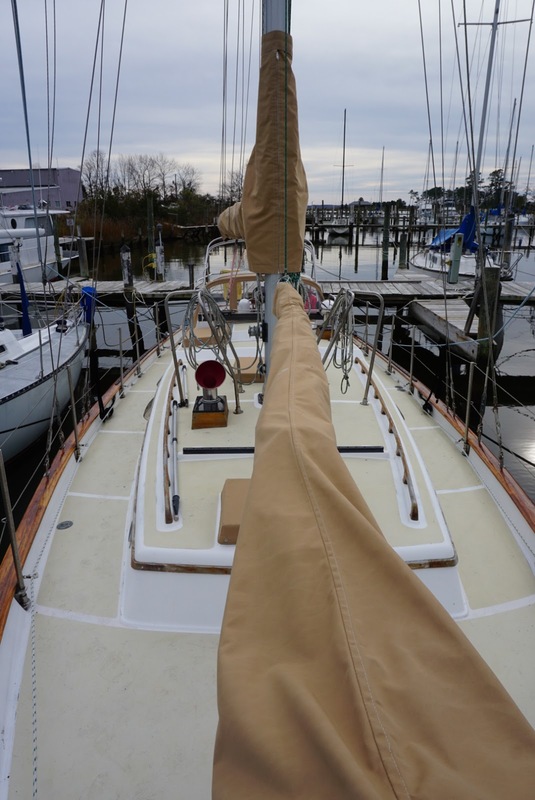 After two months at the dock, I was getting really antsy to get back to cruising. Dock life with its easy access laundry and groceries, obstructed sunsets, light polluted night skies was really getting to be a drag. Then, there's the rummaging about for sweaters and down comforters as Autumn temperatures sneak in. We just need a 24 hour weather window and we'll be in balmy Florida. 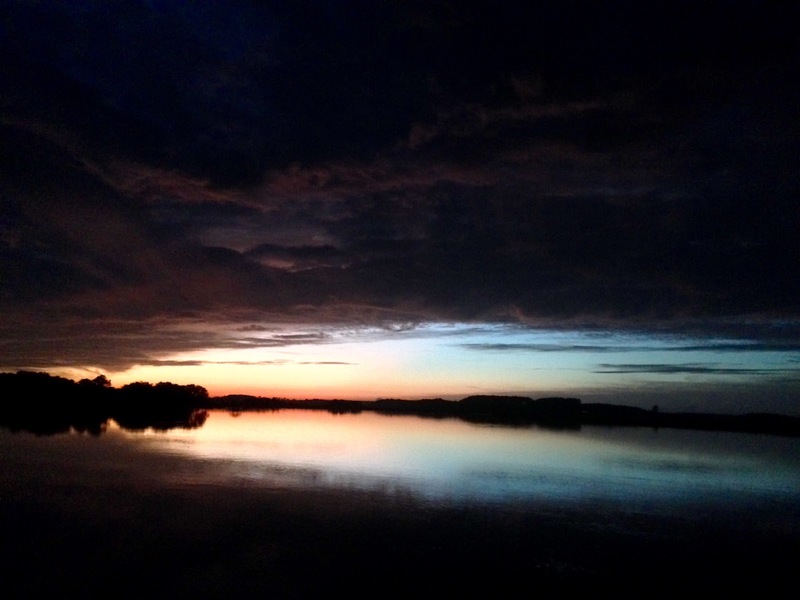 Weather forecast: strong cold front, gusty winds, thunderstorms. Anchorage possibilities: uncertain protection, uncertain dog walk ability, uncertain internet connection for work. Route between the dock and the nearest anchorage: shoals and adverse currents. Prognosis: We'll run aground, back off, hit a log, get struck by lightning, drag into the bushes, all while having no internet, getting fired, and the dog abandons ship into the marsh and away from us. We wouldn't blame him. Huh. 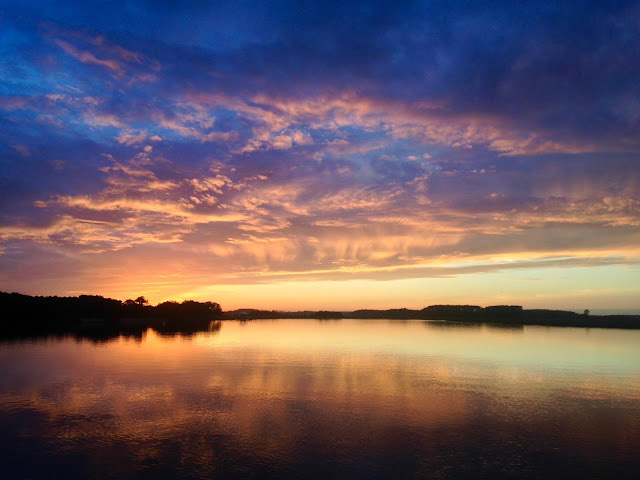 Dock life isn't so bad, is it? We delayed a day to let the cold front pass and only have to deal with 15 instead of 20 variables. Baby steps. How hard is it to calculate 13-7=6? Hard. Sleepless nights as we are forced to stay up watching the stars reflect in the still water while phosphorescence makes our anchor bridle glow. 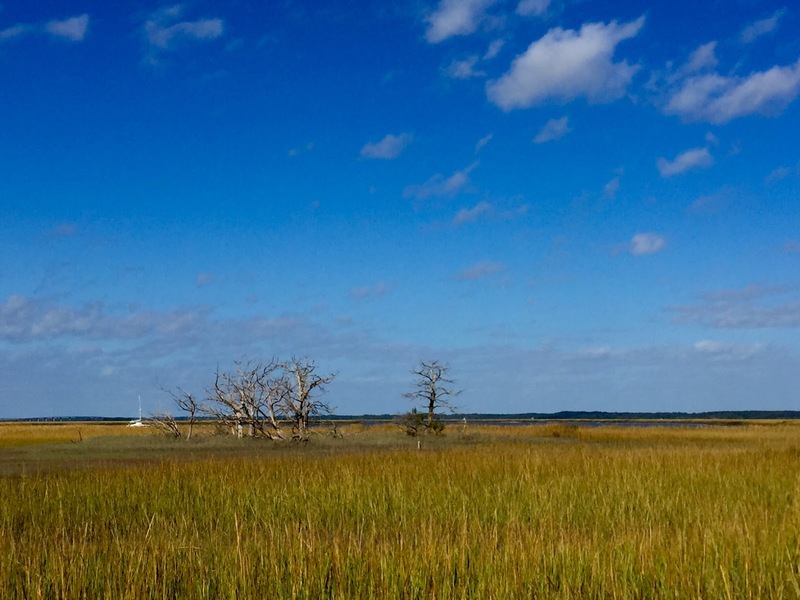 South Carolina Low Country. Can you spot Independence? Time to check the weather for our trip south. Prognosis: there are no 24 hour weather windows. Cold fronts and warm fronts will literally just move back and forth over our exact location, stalling out, raining, storming, for eternity. 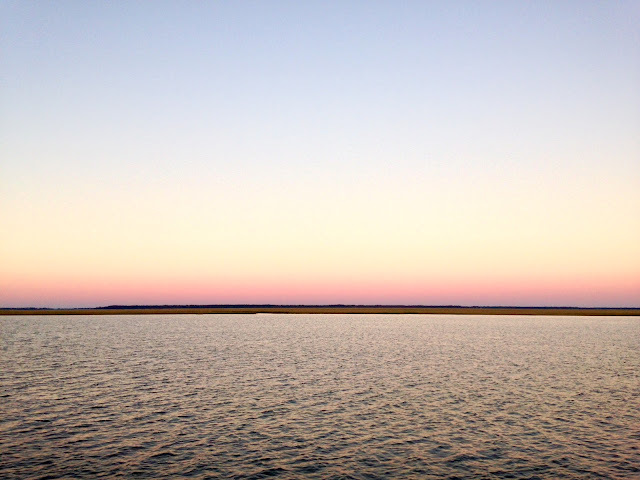 The tide is always low and the shoals are always there. The current will always be against us. We will face land walk uncertainty and internet insecurity. We'll never have a full nights sleep again. And yet? We love it. 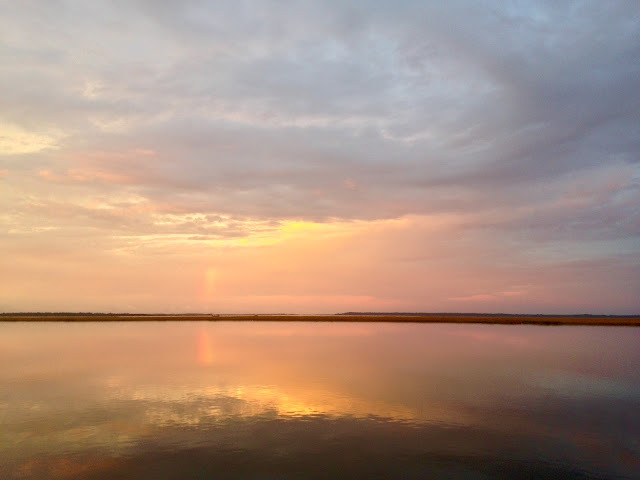 It's good to be back on the ICW. Independence, our 2005 Lagoon 380 S2 owner's version, is for sale! For complete details, please see our Yachtworld listing. We are currently en-route from Charleston, SC to St. Augustine, FL. 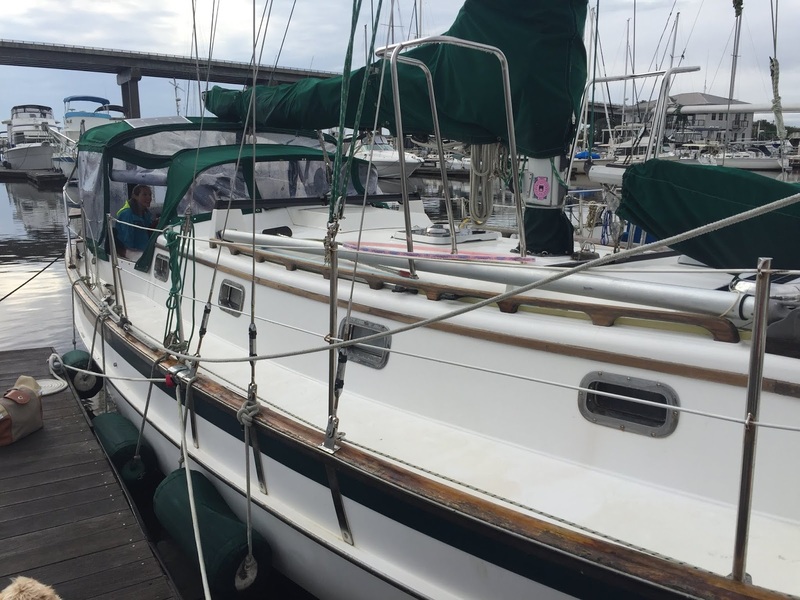 It's surprisingly hard to talk about "why" we are selling the boat. It's not you, it's me. It's financial. We planned to go back to work full-time and start back up the 401K after our cruising adventure. Now? The idea of parking the boat and commuting to work to fight with a copy machine and sit on a committee to save the preferred parking program? It's not going to happen. 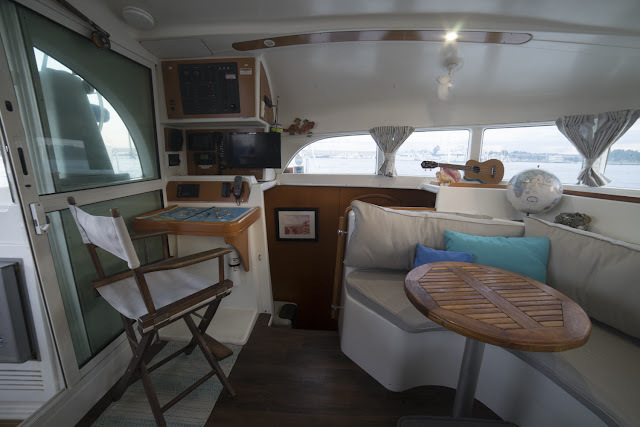 So while the original goal was to keep our catamaran forever, now the goal is to get a more economical boat so that we can live the voyaging life forever. It's practical. We have a whole hull we don't use. It's also a philosophical change. An exchange of having less and getting more. We want to be more minimalistic, and we want to live in less space. 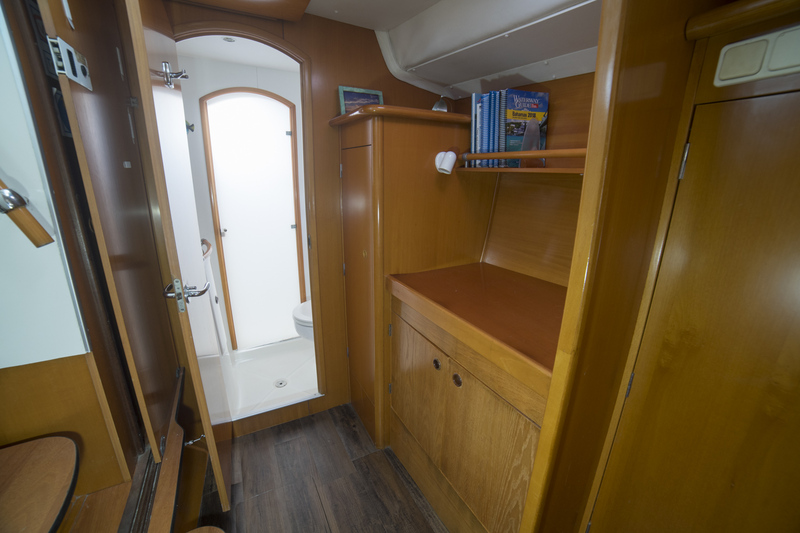 A smaller boat means we have less costs and less maintenance, and therefore we can do more cruising. And less boat gives us more options: more options for marinas and haul outs. 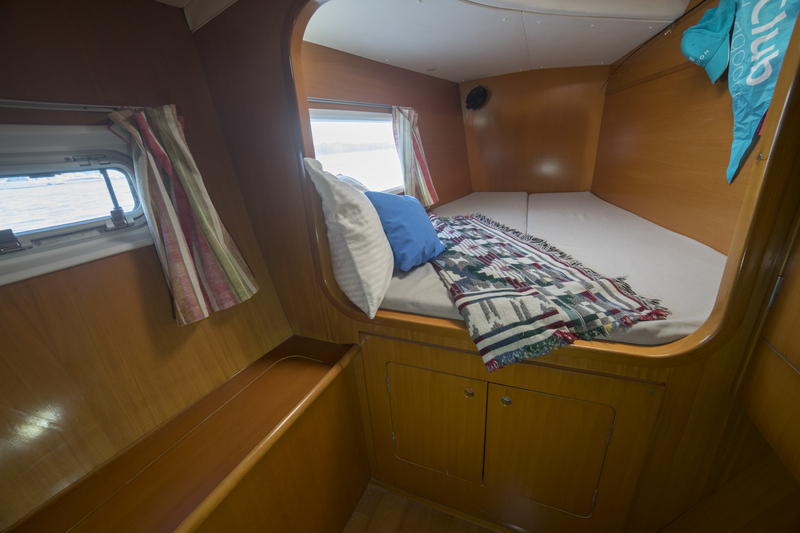 More options for traveling to Europe and finding winter haul outs and berths. An easier space to heat in winters and cool in summers. 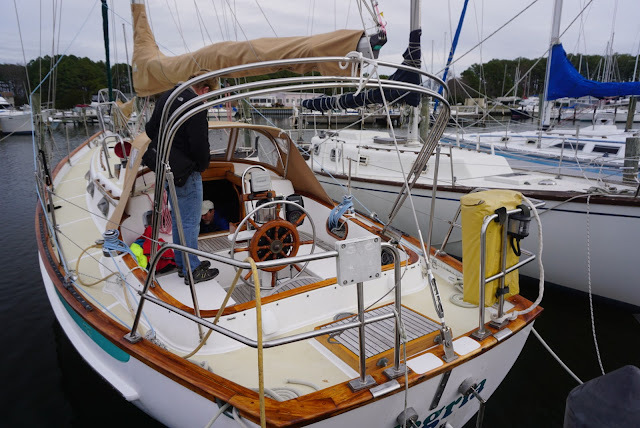 And so we want to sail a monohull. We don't want this modern light weight wood veneer anymore. We want real teak from floor to ceiling. We want a boaty boat, all cozy inside and tipping all the time. We want our wine glasses to be at risk. So there. Independence has been a great boat to us. It's hard to beat the wrap around salon windows and the fabulous views afforded from every seat in the house. She sails great and clips right along under sail or under power. If you like stability at all times, lots of storage, lots of space, and want to monitor the anchorage from any seat in the boat - she's perfect for you! She's set up for off the grid living, and she's ready to cruise to the Bahamas, the Caribbean and beyond. In reflection, it's easy to say we made a mistake. To say we should've bought the smallest, simplest boat when we left our jobs four years ago. And while that might have been the financially smartest thing to do, we wouldn't trade our time with Independence for anything. 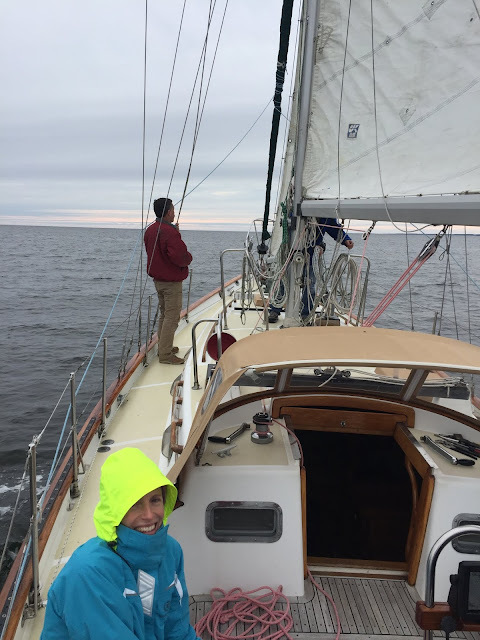 We sailed our dream boat and had a blast. We lived and loved the catamaran life. But now it's time for some new owners to take her on new adventures.